This has to be a new thread as it will be different from phase 1 in all areas. According to budget comments today, the 2nd phase will be smaller and not occupy all the land on Duke of York north of Sq One Dr. Since this is a P3 under the control of the province, the city has very input on this phase. Since the list of P3 is reduce, we will know early next year who will be building it. Need to move some of the update info from Phase 1 to this one. 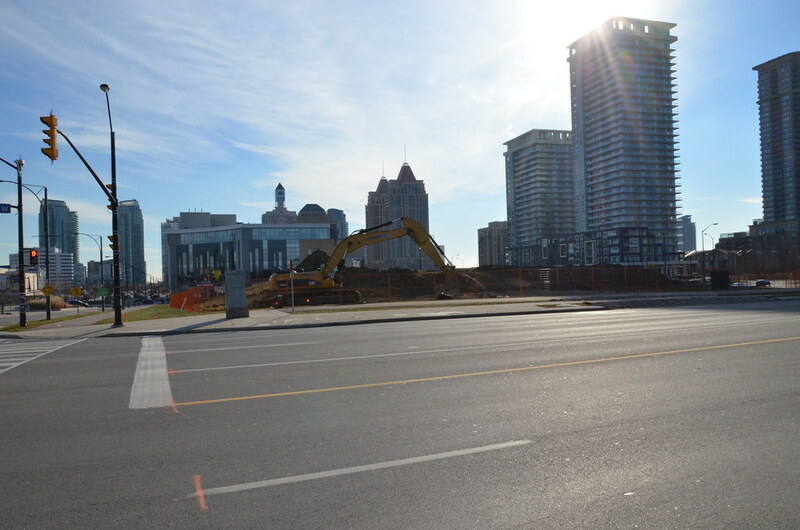 There seem to be a different view as to when this phase II will open, with the Mississauga News say 2015 and council saying 2016. One day universities and colleges will realize that students want to be in one giant campus, not to commute all over the place. Satellite campuses are constructed for particular program(s). The likelihood that one would have classes across a variety of locations is quite low. Mississauga City Council approved the Lease Agreement which will allow the construction of a second campus building on the Sheridan Institute of Technology and Advanced Learning Hazel McCallion Campus in the heart of downtown Mississauga. According to officials, the campus in downtown Mississauga has already exceeded expectations. It has surpassed projected numbers for enrollment, courses and campus use. There are currently 2,700 students enrolled in a range of business diploma and graduate certificate programs, with five new business degrees set to launch in September. The expansion will enable Sheridan to accommodate up to an additional 3,200 full-time students. â€œThe addition of a second building will build on the unique partnership between the City and Sheridan. Sheridanâ€™s success in surpassing set goals for enrollment and courses offered supports our vision for expanding educational opportunities in Mississauga and our Strategic Plan objectives,â€ said City Manager and CAO Janice Baker. Baker noted that construction on the second building of the Sheridan Hazel McCallion Campus, will begin later this year. The new building is expected to be completed in the summer of 2016 and ready for students that September. The Phase One Building of the Sheridan HMC campus opened in the fall of 2011 and was developed on 0.45 ha (1.13 ac.) together with approximately 0.52 ha (1.29 ac.) of new parkland that is now known as Scholarsâ€™ Green. The Lease Agreement for Phase Two grants Sheridan a 95-year lease allowing construction of a post-secondary education facility on 0.74 ha (1.83 ac.) of the property, with an option to develop a possible extension to the Phase Two building within five years. The City and Sheridan also reached an agreement on sharing costs on certain streetscape works and the design and construction of future parkland. The location of the future park block will be situated immediately west of the Phase 2 campus building representing approximately 0.55 ha (1.37 ac.) of new parkland in downtown Mississauga. Note: A Request for Proposal to design, build and finance this project has been issued for shortlisted pre-qualified teams. Further update summer 2014. Project: construction of an educational building which will contain computer laboratories, faculty offices, gallery space, state-of-the-art classrooms and a Centre of Creative Thinking. Owner Complete information is available to subscribers. Click HERE to find out how to subscribe. Coordinator Complete information is available to subscribers. Click HERE to find out how to subscribe. Owner's representative Complete information is available to subscribers. Click HERE to find out how to subscribe. First report Wed Jan 30, 2013. Last report Wed Oct 23, 2013. This report Mon Feb 03, 2014. MISSISSAUGA, ON, Sept. 15, 2014 /CNW/ - Sheridan College and Infrastructure Ontario (IO) have selected Sheridan Creative Partnership as the preferred bidder to design, build and finance Phase II of Sheridan College's Hazel McCallion Campus development in Mississauga. The project is intended to achieve the Leadership in Energy and Environmental Design (LEED) Silver certification, designed towards optimal energy efficiency, healthy indoor environments and reduced greenhouse gas emissions. The selection of the Sheridan Creative Partnership consortium is the result of an open, fair and competitive procurement process that began in January 2013. Throughout its submission, Sheridan Creative Partnership demonstrated a clear understanding of designing and constructing a postsecondary education facility. The consortium members include Bondfield Construction Company Limited (developer and construction), Moriyama & Teshima Architects/Montgomery Sisam Architects and Rocklynn Capital Inc.
Infrastructure Ontario will now begin negotiating contract details with Sheridan Creative Partnership and expects to reach commercial and financial close in October 2014. The project cost will be announced publicly following the completion of negotiations, with construction expected to begin shortly thereafter. IO, the Ministry of Training, Colleges and Universities and Sheridan College are working together to procure and deliver the project. IO is a Crown agency of the Province of Ontario that works to deliver public benefits through partnerships with the private sector. IO delivers large, complex public infrastructure projects using a made-in-Ontario modern procurement and project management practice called Alternative Financing and Procurement (AFP). IO also partners with the private sector to manage one of the largest real estate portfolios in Canada, provides municipalities and eligible public-sector clients with loans to renew public infrastructure, and leverages its private-sector expertise to advise the provincial public-sector clients on commercial transactions. Sheridan is one of Canada's leading postsecondary institutions, enrolling over 18,000 full-time students in over 100 diploma, certificate, and bachelor degree programs on four campuses in three cities. Its 133,000 alumni continue to shape the future course of our society in the arts, in business, and in the fields of technology and community service. Visit www.infrastructureontario.ca or www.sheridancollege.ca for more information. "Sheridan's Hazel McCallion Campus expansion project will provide more space for innovative programming that delivers on the government's commitment to expanding the quality of and access to postsecondary education opportunities in Ontario." "The Sheridan Creative Partnership team has successfully demonstrated their proposal delivers the best value for Ontario taxpayers; we look forward to the commencement of construction for Phase 2 of Sheridan's Hazel McCallion Campus this fall." "With the expansion of the Hazel McCallion Campus at Sheridan College, the City of Mississauga is growing in its ability to offer world-class educational opportunities for students as well as wider-reaching benefits for the larger community as a whole." "The growth of the Hazel McCallion Campus will bring a broader range of academic options to the heart of Mississauga's city centre, building on the tremendous success of our current facility, with its focus on business diplomas, degrees and post-graduate certificates. Our expanded campus will be a destination of choice for students in Mississauga and beyond." any rendering the new campus ? The 67 million dollar design-build contract was awarded today by IO to Sheridan Creative Partnership, a consortium consisting of Bondfield Construction Company, Moriyama & Teshima Architects, Montgomery Sisam Architects and Rocklynn Capital. There are two more renderings in the dataBase file. North parking lot is now fence off with construction trailer on site. Construction to get underway in Jan 2015. Considering construction is just getting started I would say 2016 is far more likely if not guaranteed.